Today, just as in Joseph Smith’s time, there are many different churches and religions. People often sense an overwhelming array of choices, not only in religion but in every facet of life. In ancient Judeo-Christian thought, however, there were only “two ways,” of which Nephi’s two churches are a typological representation. The doctrine is also clearly articulated only a few verses before Nephi mentions the two churches (see 1 Nephi 14:7). 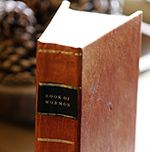 [iv] This truth revealed by the Book of Mormon about the fundamental binary nature of this world is not typical of Western thought, but it is deeply embedded in many ancient Israelite texts. One of Lehi’s contemporaries, Jeremiah, wrote, “Thus saith the Lord; Behold, I set before you the way of life, and the way of death” (Jeremiah 21:8). Psalm 1 declares, “For the Lord knoweth the way of the righteous: but the way of the ungodly shall perish” (Ps. 1:6). A dramatic example of the doctrine is found in Deuteronomy, where Moses is recorded as saying, “I have set before thee this day life and good, and death and evil,” which the people must choose between: “I call heaven and earth to record this day against you, that I have set before you life and death, blessing and cursing: therefore choose life, that both thou and thy seed may live.” (Deuteronomy 30:15, 19). How are we to understand these stark contrasts in today’s diverse society? Why is Nephi’s statement ultimately important today? While Nephi spoke of “two churches” or two ways of life, one of those ways leads into a maze of many strange roads and mists of darkness. The Savior spoke of a “broad” way, and Nephi’s great and abominable church is comparable to the great and spacious building of his father’s dream. [ix] Both the broad way and spacious building suggest room to wander down various paths and hallways while ultimately all ending up in the same place of darkness. Thus, Lehi’s dream mentions the one “strait and narrow path” and in contrast the many “forbidden paths” (1 Nephi 8:20, 23, 28). The prophetic worldview, sometimes called the apocalyptic worldview, sees the world from this perspective of the end-of-time reality and expresses its urgent messages in terms of a stark dualism, calling people continuously back to the iron rod and to the path that leads to life and the love of God. Brant A. Gardner, Second Witness: Analytical and Contextual Commentary on the Book of Mormon, 6 vols. (Salt Lake City, UT: Greg Kofford Books, 2007–2008), 1: 247–248. John W. Welch, “Connections Between the Visions of Lehi and Nephi,” in Pressing Forward with the Book of Mormon, ed. John W. Welch and Melvin J. Throne (Provo, UT: FARMS, 1999), 49–53. Mack C. Stirling, “The Way of Life and the Way of Death in the Book of Mormon,” Journal of Book of Mormon Studies 6, no. 2 (1997): 152–204. Hugh Nibley, An Approach to the Book of Mormon, third edition (Salt Lake City and Provo, UT: Deseret Book and FARMS, 1989), 160–161. [i] See Mack C. Stirling, “The Way of Life and the Way of Death in the Book of Mormon,” Journal of Book of Mormon Studies 6, no. 2 (1997): 152–204. [ii] Hugh Nibley, An Approach to the Book of Mormon, third edition (Salt Lake City and Provo, UT: Deseret Book and FARMS, 1989), 161. [iii] Brant A. Gardner, Second Witness: Analytical and Contextual Commentary on the Book of Mormon, 6 vols. (Salt Lake City: Greg Kofford Books, 2007–2008), 1: 248. [iv] D. John Butler, Plain and Precious Things: The Temple Religion of the Book of Mormon’s Visionary (Lexington, KY: self-published, 2012), 146–147. [v] See Daniel P. Bricker, “The Doctrine of the ‘Two Ways’ in Proverbs,” Journal of the Evangelical Theological Society 38, no. 4 (1995): 501–517. [vi] See Kevin Christensen, “Paradigms Regained: A Survey of Margaret Barker’s Scholarship and Its Significance for Mormon Studies,” FARMS Occasional Papers 2 (2001): 19–21; Kevin Christensen, “The Temple, The Monarchy, and Wisdom: Lehi’s World and the Scholarship of Margaret Barker,” in Glimpses of Lehi’s Jerusalem, ed. John W. Welch, David Rolph Seely, and Jo Ann H. Seely (Provo, UT: FARMS, 2004), 452–457, 488–504. [vii] Donald W. Parry and Emanuel Tov, The Dead Sea Scrolls Reader: Volume I, second edition, revised and expanded (Leiden and Boston: Brill, 2013), 3. [viii] Several examples are listed in Gardner, Second Witness, 1:247–248. [ix] John W. Welch, “Connections Between the Visions of Lehi and Nephi,” in Pressing Forward with the Book of Mormon, ed. John W. Welch and Melvin J. Throne (Provo, UT: FARMS, 1999), 51–52. Good article - but I disagree with one point. Under the examples of "A creation composed of opposites," the author has listed "male and female." I would like to think that male and female are complimentary, and not a part of "Opposition in all Things." We certainly have differing roles, but not opposing roles.